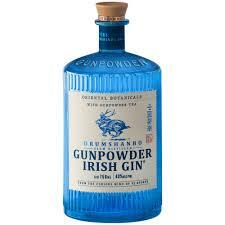 Drumshanbo Gunpowder Irish Gin is an oriental inspired Gin from The Shed Distillery in Co Leitrim. Taking its name from one of the signature botanicals, slowly dried Gunpowder tea, the recipe also includes lime, lemon and grapefruit. This will work best with a Mediterranean tonic water. The flavour is bold and bright with a slight spicy freshness.